I began to use the wash with such high hopes...but it didn't work out as I hoped. I believe that regular soap (like dove bar) removes more oil from my face than this cleanser and at a fraction of the price. The oil on my face has not diminished in the least and I am almost done with the 7oz bottle I purchased. My face has actually never been as oily as it is has been in the past few months (while using the product). I'm not saying that the cleanser is to blame (although I am doing nothing different) but it hasn't helped at all. I would not recommend this product if you are struggling with a 'true' oily skin issue, maybe my case is extreme. I have pretty oily skin (and hair) so I was looking for a face wash that would keep me less oily throughout the day but this did not do that for me. It was a nice wash plain and simple and did not over dry but I think this would be perfect for someone with sensitive skin. I was just expecting a miracle. I do however use other PCA products. There are several PCA products I use and this is my daily wash. I tend to have occasional break outs and this wash keeps them at bay. The wash is very gentle and mild. My skin feels clean and fresh afterwards. It's also a GREAT VALUE. I keep one of these washes by my sink and one in the shower. Highly recommend! I have been using PCA Skin products failthfully for over a year on the recommendation from my aesthecian. I noticed a dramatic difference in the health of my skin including reduced pore size and softeneing of some small wrinkles in 4 weeks (as did my dear aesthecian). As with any regime you need to be faithful day and night. I am 49, with fair skin, some hyperpigmentation - In addition to this cleanser, I used the sunscreen, 15% C cream, toner and the exfoliant cream that I mex with the cleanser 2X a week. I have combination skin that is very sensitive. Since trying a sample of this, I am completely sold. I have been using for about a month and love the results. It keeps excess oil off my face but also keeps the redness away. I have used many products over the years PCA beats them all....I have seen results in as little as 2 weeks! The best cleanser I ever used and my son love it,too.I'm a PCA lover now. I love this face wash. My face feels so clean after I wash it. 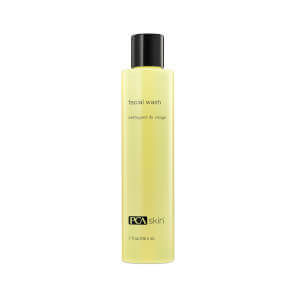 My face is very prone to breakouts and this face wash really helps! i have extremely sensitive skin, been using this stuff for around 6 months or so now, it cleans well but is extremely delicate. i've never been able to wash my face without any redness before. also has really helped clear my skin up.